If you’re interested in querying log file and gaining insights through Hive LLAP, please try HDInsight Tools for Visual Studio Code (VSCode). If you’re looking for data warehouse query experiences for big data, please try HDInsight Tools for VSCode. If you are a data scientist looking for interactive tools and BI applications for big data, we suggest you try HDInsight Tools for VSCode. If you’re a python developer for HDInsight Spark, we ask you to try HDInsight Tools for VSCode! Along with the general availability of Hive LLAP, we are pleased to announce the public preview of HDInsight Tools for VSCode, an extension for developing Hive interactive query, Hive Batch jobs, and Python PySpark jobs against Microsoft HDInsight! This extension provides you a cross-platform, light-weight, and keyboard-focused authoring experience for Hive & Spark development. HDInsight Tools for VSCode not only empowers you to gain faster time to insights through interactive responses, cache in memory and higher levels of concurrency from Hive LLAP, but also offers you a great editor experiences for your Hive query and PySpark job with simple getting started experiences. Interactive responses with flexibility to execute one or multiple selected Hive scripts. 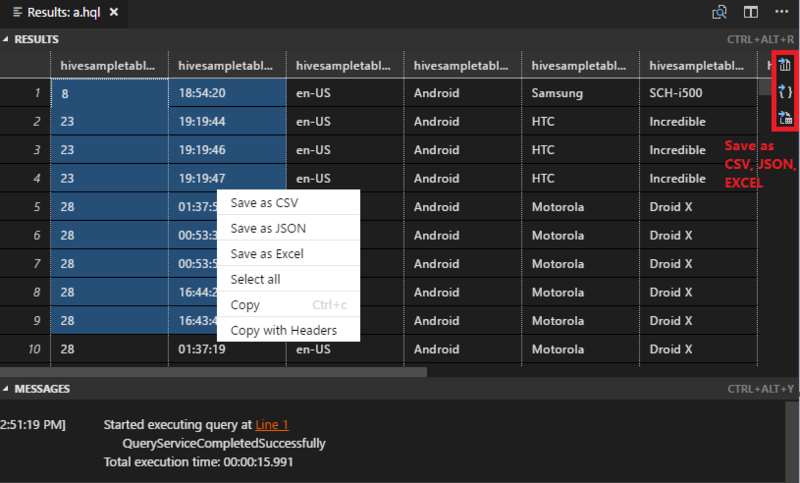 Preview and export your Hive interactive query results to csv, json, and excel format. Built in Hive language service such as IntelliSense auto suggest, auto complete, error marker, among others. Python authoring with language service and HDInsight PySpark job submission. Link with Spark UI and Yarn UI for further trouble shooting. Simply open your Hive or Python files in your HDInsight workspace and connect to Azure. You can then start to author your script and query your data.